People all over the world love pizza, not just in America and Italy. You can find a pizza restaurant wherever you go. There were over 75,000 pizza places in the US alone in 2017. Worldwide, the revenue from selling pizza topped 134 billion USD in 2017. As competitive as the business is, restaurants look for any means to get our attention. One way to do that is to make huge pizzas that draw attention from the media. Giant pizza-making events have not only benefitted individual restaurants. City governments and food manufacturing companies have participated in making big pizzas. The companies and organizations involved often donate proceeds or pizza to charitable organizations. Everyone benefits, but pizza lovers benefit the most. With a name like The Pizza Machine, you might expect some robot to deliver a pizza, or at the very least, to get your pizza from a vending machine. The Pizza Machine in this case was actually a giant crane that delivers a 40” pizza to your table. The restaurant may be a more interesting story than the actual pizza, which compared to some of the pies on this list, is tiny. The restaurant closed several years ago. Now, the owners serve pizza “food truck” style from an old school bus. Yes, the 40” signature pizza is still available, and so is the crane. The owners don’t set prices for their pizza. They ask customers to pay what they believe the pizza to be worth. One of the most popular restaurants in San Antonio, TX, Big Lou’s Super 42 focuses on weight as much as it does square inches. The restaurant emphasizes toppings in its size calculations, allowing customers to pile on pounds of whatever they like. The pizza can end up weighing as much as 30 pounds, which is as much as a couple of the larger sized pizzas in this list. If the 42” pizza is too much for you, you can step down to Lou’s 37” version. Big Lou’s Super 42 is popular even on television, having been featured twice on the Travel Channel and once on Food Network. 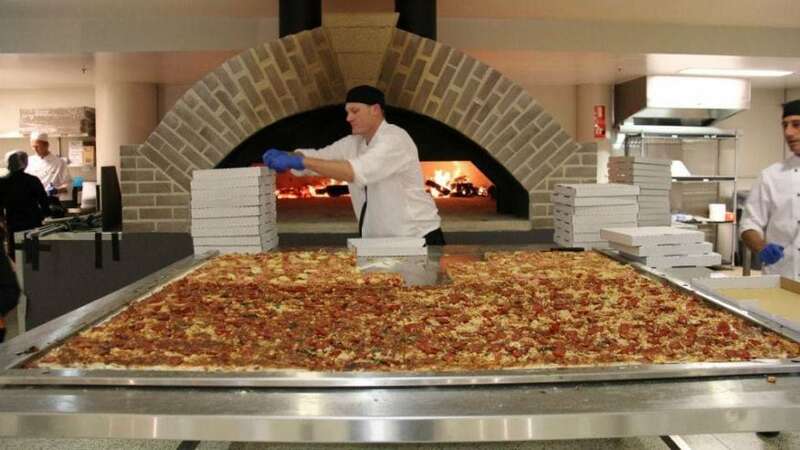 For eight years, Big Mama’s and Papa’s Pizzeria in Los Angeles held the record for the largest commercially available and deliverable pizza in the world. 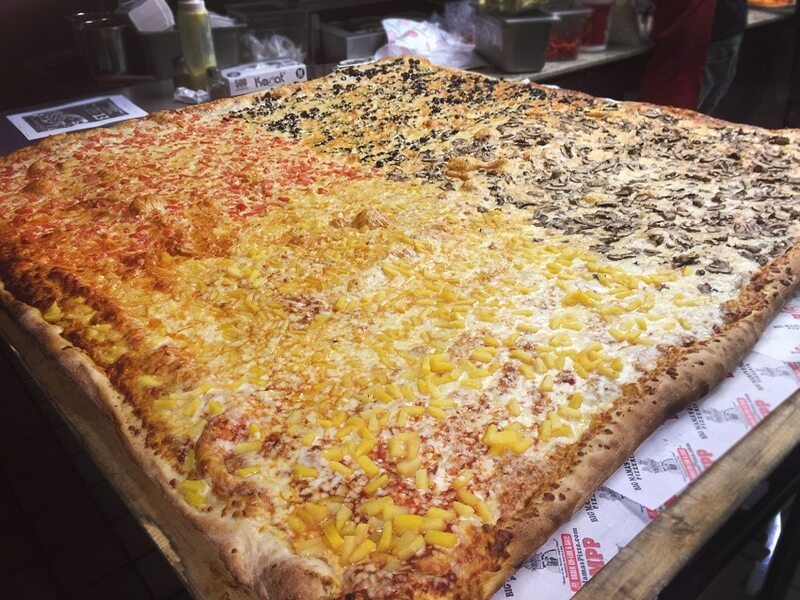 The Giant Sicilian is a 54” square, thick crust pizza that feeds up to 70 people. The restaurant sponsors a pizza eating contest involving their flagship pizza. If eight people can finish the pizza within two hours, the pizza is free and the group wins a cash prize. As of 2018, no one has been able to win the prize. The pizza is so large, the restaurant had to build a special container for their delivery vehicle. The container is attached to the roof of the car. It’s said that the people in Texas like things big. That goes for pizza, too, it seems, as the largest commercially available pizza is sold in Burleson, a city outside of the Dallas/Ft. Worth area, at the Moontower Pizza Bar. It takes about 10 pounds of cheese and 10 pounds of dough to make one of these pizzas, as well as the restaurant’s own homemade sauce. It takes two-day’s notice to order one of these giant square pizzas. The Moontower establishment specializes in giant pizzas. 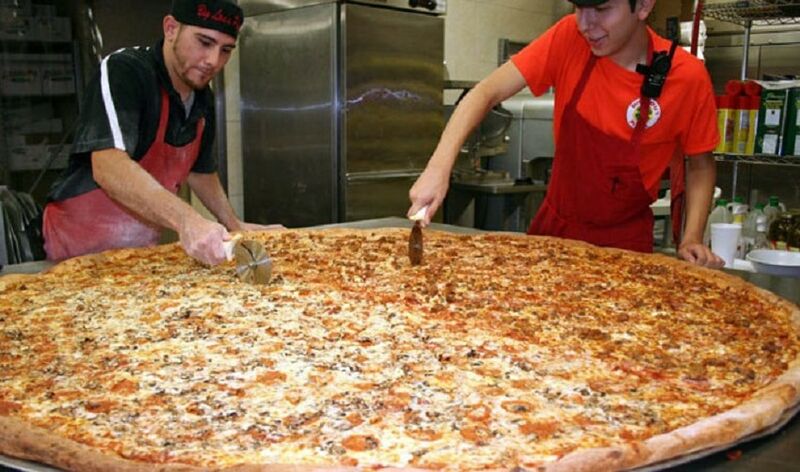 They also deliver a 30” pizza which is twice the size of the largest pizza one can order at most restaurants. Sports fans can work up an appetite. The Il Colosseo restaurant in the Allphones Arena had something that would satisfy the hungriest of customers. The Colossus was a 58-pound pizza that was in 2012 the largest commercially available pizza in the world. The restaurant had a custom-made oven for their 600 AUD pizza, and used 28 pounds of flour and 10 pounds of cheese as base ingredients. The restaurant also had a pizza eating challenge where the group who could finish the pizza would win four free tickets to all events at the arena for one year. The giant pizza wasn’t enough to attract customers and the restaurant closed. Napoli pizza is a well-loved style of pizza all over the world. The Napoli Pizza Association hasn’t lost sight of that fact, working to keep the Napoletani pizza in the public eye. One of their big events is the Napoli Pizza Festival. 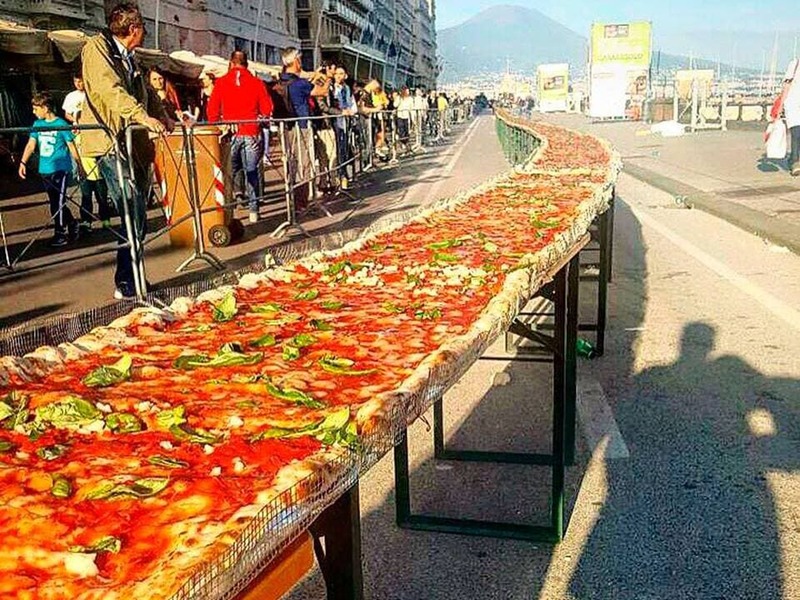 That’s where, in 2016, local organizations joined forces to build what was at the time, the world’s longest pizza. The organizations involved donated the pizza to various charitable organizations in Italy, though anyone who attended the festival was able to grab a slice to take home. The chefs used several mobile wood-burning ovens to cook the mile-long pizza. 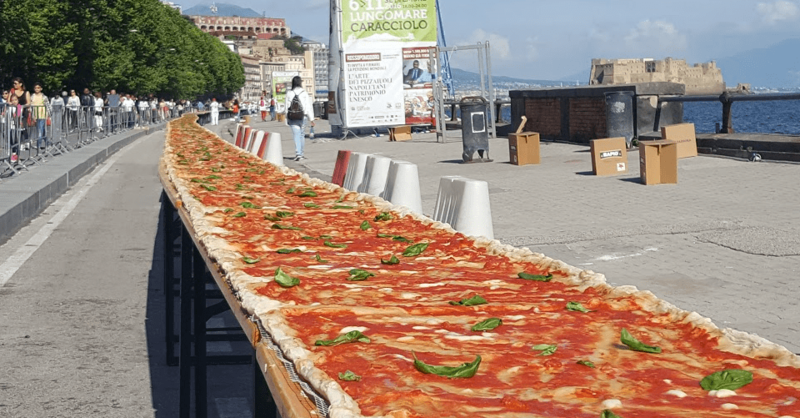 When the owner of PizzaOvens.com, Fash Asvadi, saw that the Napoli team had created the world’s longest pizza, he wanted to get together a team of some of the best pizza makers in California to beat that record. Asvadi recruited donors to supply the ingredients, then picked a local motor speedway as the venue to start the bake, which began at 7 AM for prep and finished cooking by 4 PM. The baking employed some creative cooking measures, like employing a mobile oven and dozens of volunteers to feed the dough through it as it rounded the curve on the racetrack. After the pizza was finished, the spectators who watched the event received a free slice. However, most of the pizza was delivered to homeless shelters in the area. 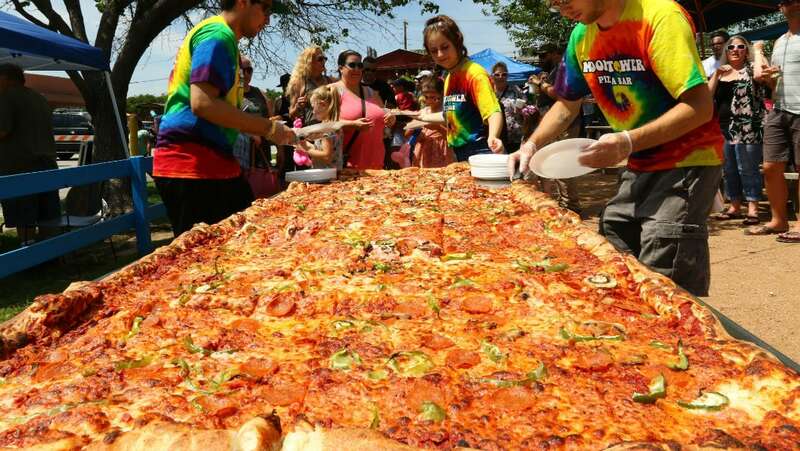 Lorenzo Amato seemed dead set on setting a world record for creating the largest pizza ever. Twice he succeeded, and twice someone else bettered him. Still, his 1987 effort is recognized as one of the largest pizzas ever built. From his restaurant in Tallahassee, FL, he built what was at the time the world’s largest oven to build the record-setting pizza. It was a 73 foot in diameter griddle heated by hundreds of propane tanks. Amato sold slices of the pizza for a $1, which he donated to the American Red Cross. It cost Amato $250,000 to make the pizza, half for the oven, half for the pizza ingredients. Roma Foods sponsored his try, giving him $500,000 to do the job. Like other pizzas on this list, the pizza created by a team at the Norwood Pick n’ Pay Hypermarket in Johannesburg was a marketing ploy. However, it was marketing in service of a good cause, as the proceeds from the sales of the thousands of slices from this pizza went to charitable organizations in South Africa. Most of the proceeds went to St. Mark’s College, a high school in a Black township in South Africa. The municipal government of Johannesburg was in on the act. The mayor cut the first slice. No word if he actually ate one. 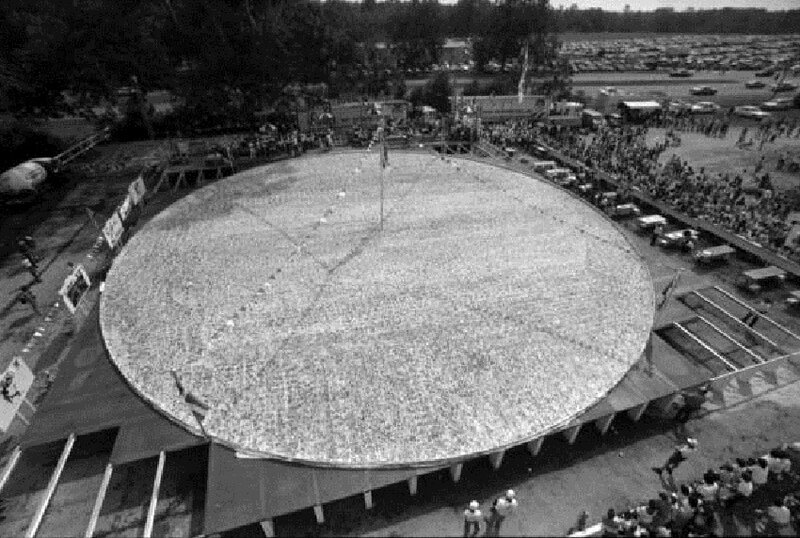 While in second place all-time for the largest pizza, the Norwood effort is still today the heaviest pizza ever, weighing about 27,000 pounds. 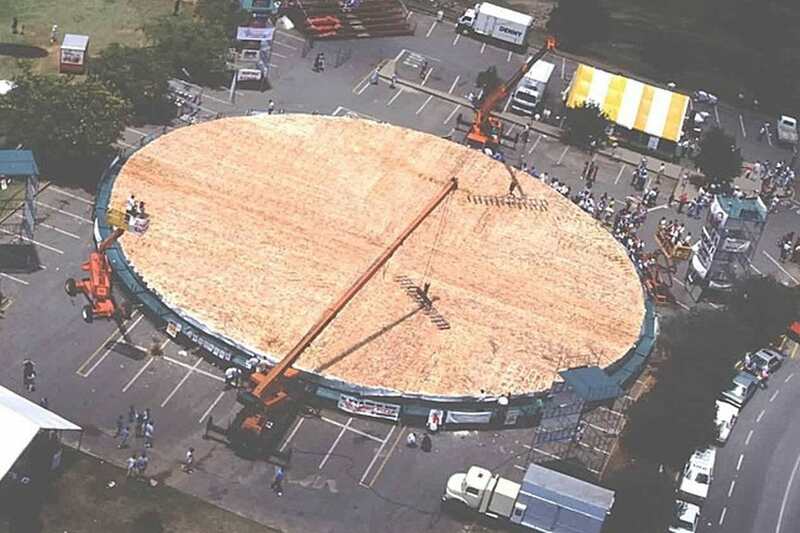 The Ottavia is the Guinness Book world record holder for the largest pizza ever created. This gluten-free monstrosity was created by Nardi in Rome along with two other lead chefs and a team of dozens of assistants in the margherita style. 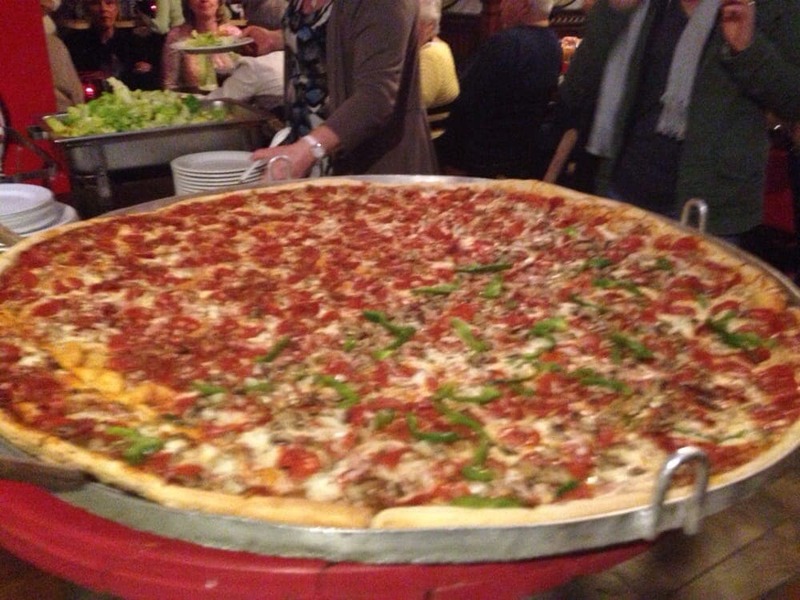 The pizza is 131 feet in diameter. Of course, no oven exists large enough to bake the pie in one go, so they had to bake the dough in over 5,000 separate batches. The chef said that he created the pizza to demonstrate the economic and cultural recovery of Italy. The idea for making a pizza this size came from Ulrich Ladurner of the Dr. Shar group to demonstrate that gluten free food can be fun and tasty.